PART 1: General Aptitude- 25 questions; PART 2: Computer Concept- 25 questions. Correct answer: (+) 4 marks; Incorrect answer: (-) 1 mark. PART 1: General Aptitude- 100 questions; PART 2: Computer Concept- 100 questions. Mode: MAH MCA CET 2019 will only be held in the online mode which will be a Computer Based Test. Candidates are required to mark answers on the computer screen. Medium: The exam will be conducted in English only. Exam Duration: Time allotted for the MAH MCA CET 2019 test is 90 minutes. Types of Questions: Questions in the MAH MCA CET 2019 test will be Objective Type Multiple Choice questions. For every question, four options will be given out of which only one option will be correct. 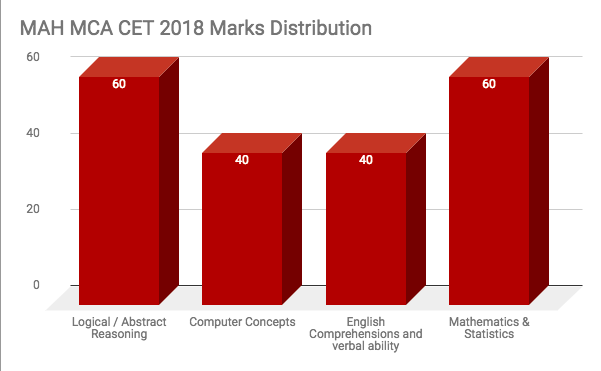 Sections: MAH MCA CET 2019 will be conducted in four sections of 200 marks. The four sections of the exam are Logical / Abstract Reasoning, Computer Concepts, English Comprehensions and verbal ability and Mathematics & Statistics. Negative Marking: 0.5 marks will be deducted for each incorrect response.